I have spent the last hour giving my maid instructions in the most basic of her duties – cleaning. Yes, I agonise a lot about my househelp, but that’s because in Uganda we insist on getting people out of their muddy hovels in remote villages and bringing them to the city to help keep our tastefully appointed houses clean and orderly. We get primary two drop-outs with no considerable history of interaction with electricity and charge them with operating flat irons, microwave ovens, electric cookers and, in extremely misguided cases, vacuum cleaners. Which is why my current maid – the first one I have found close to acceptable in decades of actively loathing domestic help – has had me frustrated for the last one hour of my life. I am in no way related to her but these people have a tendency of calling you ‘Uncle’ or ‘Aunt’, which I prefer to the first-name basis some people go for with their domestics. But today I wasn’t taking a ‘me no understand’ from anyone. I emerged from my chambers to inspect the breakfast offering and caught her wiping the fridge door with a dirty rag – to be precise, a tea towel that has probably been in residence for a year or so. Tea towels cost an average Ushs1,500 each (as low as Ushs500 if you are a sensible shopper but as high as Ushs6,000 if you insist on doing your shopping in high-end ‘malls’), and we have a policy of buying a couple every other week just so the crockery stays clean. That policy is supposed to be complemented by a disposal system that should rid us of filthy rags such as was wiping the fridge door this morning, but the maids can never seem to get the point of throwing old things away. Taking the lesson from the very top, I explained (again) the origin of man and disease, the risks associated with the ingestion of germs, the folly of poor hygiene, and the damage to one’s face that could be caused by the rapid acceleration of my hand with the full weight of my arm pivoting outwards as would have resulted if she did not immediately dispose of all tea towels older than three months old. Thus, she grasped the point. The excitement going round at the installation of a new cabinet is palpable (another one of those words we always like to use regardless of what they mean). The last cabinet we had was fantastic when we first put it in, but the newspapers started messing it up within a very short time. I have always detested newspapers for this purpose but everyone seems to think that’s what they are for, so whenever we have a new cabinet put in place newspapers go into action before anything else. 1. The edge of the newspaper curls up in that funny way and gets in the way of the door closing. 2. The newspapers turn dirty brown after some time and you just know that the cups and plates are full of germs. 3. 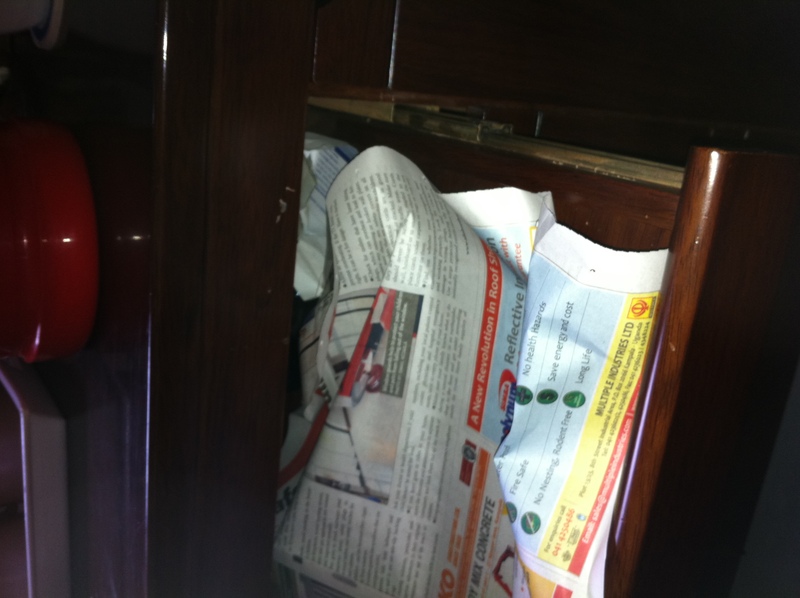 The moment you place a cup or plate inside the cabinet without drying it thoroughly, the newspaper is gone. 4. And don’t get me started on the time you pour yourself a much needed hot cup of tea, take a sip and …ugh! Newspaper bits! The literary Jedi, that is. This morning I watched the most magnificent traffic jam building up in Kampala, from the Mulago roundabout all the way to the Uganda Wildlife Authority offices in Kitante. It was so neat I suspected that Events Warehouse or Silk Events were putting it together. By the time I got to the junction at John Babiiha Avenue I was fighting the temptation to park somewhere and watch the progress. 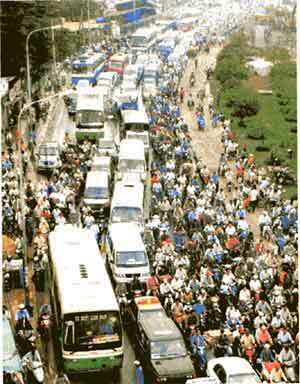 If I were Chinese I’d probably have set up a betting table and posted odds on how far the jam would go. Then, I’d have gotten cronies to place bets on Bukoto, around Kabira Country Club. A little bit more entrepreneurship would have had me funding popcorn stands along the way for people to enjoy the show with snacks in hand.